In honor of the blog's 4 month birthday the Twinner has decided to give away TWO POUNDS of her very own roasted coffee. TWO POUNDS! 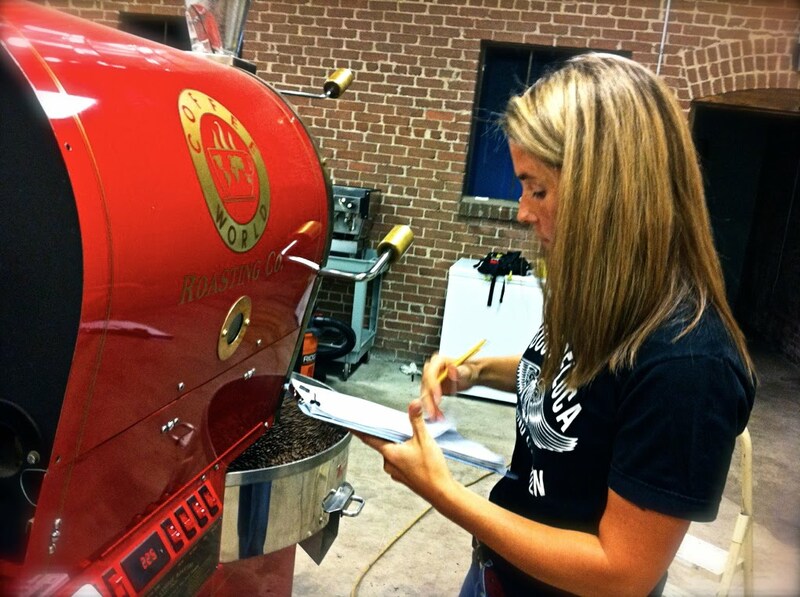 Did you know she has been a roaster for almost 6 years? She's kind of my hero. She even has coffee bean burns on her feet, which is I guess what happens when you refuse to roast in anything but your Rainbows. This weekend Twinner came up with two special blends for you. Today's Letters Woobie Cape & Smartwool Blend + Today's Letters Fist Pump & Leg Shimmy Blend. To enter, just leave a comment below by Sunday, August 26th and we'll announce the winner next week! Ps, Hope your weekend was lovely. We took 3 naps, ate 4 Popsicles, and watched 2 movies. We. Are. Happy. Campers. And a leg shimmy for first comment!! Being a coffee roaster does make your twinner cool. We drink lots of coffee in our house. I am so looking forward to Autumn, when we need it to stay warm. If I won, there would definitely be some fist pumps and leg shimmies. Coffee, the 100% natural replacement for sleep! My love affair with coffee is deep and real - I would cherish those blends!!!! I would dance and shimmy if I got the coffee... And I'll tell the town of Denver just how fine it is!! Love from the Mile High and happy 4 mos baby blog!!! 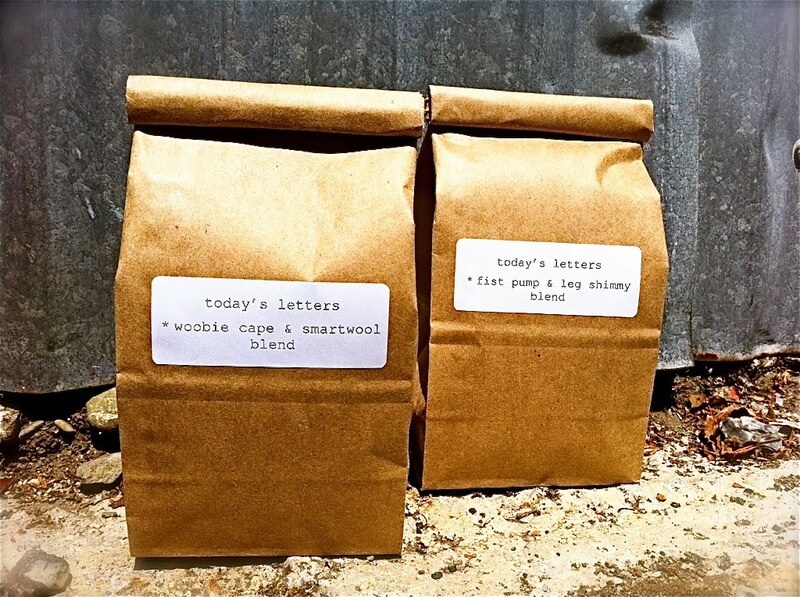 Definitely do cartwheels for today's letter's fist pump and leg shimmy blend! Cuute of her to make you yr very own beans! Holy cow, I love coffee. It is so awesome that your sister brews her own! Thanks for the giveaway, I love your blog! coffee already makes me shimmy and shake. yum-o. can the next prize be that both twinners teach me their coffee-roasting and fist-pumping skillz? my favorite set of twinners always are the best! you both come up with the most creative and delicious ideas!!!!! drinking my own cup now. buut drinking today's letters' coffee and reading today's letters?--now that sounds like something special and especially tasty. woo! baby's out...finally consuming many cups of strong black coffee. coffee, coffee, coffee! yay. Lovin' the blog! I lived in East Africa and worked for a woman who grew and roasted her own coffee. Let me just say that after my two-year stint there, I was spoiled rotten. That was two-and-a-half years ago. I hope I win! would share either one of these with my hubby. wouldn't be coffee in bed thanks to the internal alarm clock in our young'in, but it would be coffee on the couch in front of cartoons. I would LOVE to try those special blends! Whoaaa! Awesome way to start a morning! First your twinner is a beast! whoop! Second I just moved out to Colorado & realized how much "good" coffee actually costs. So this would bless my socks off!! 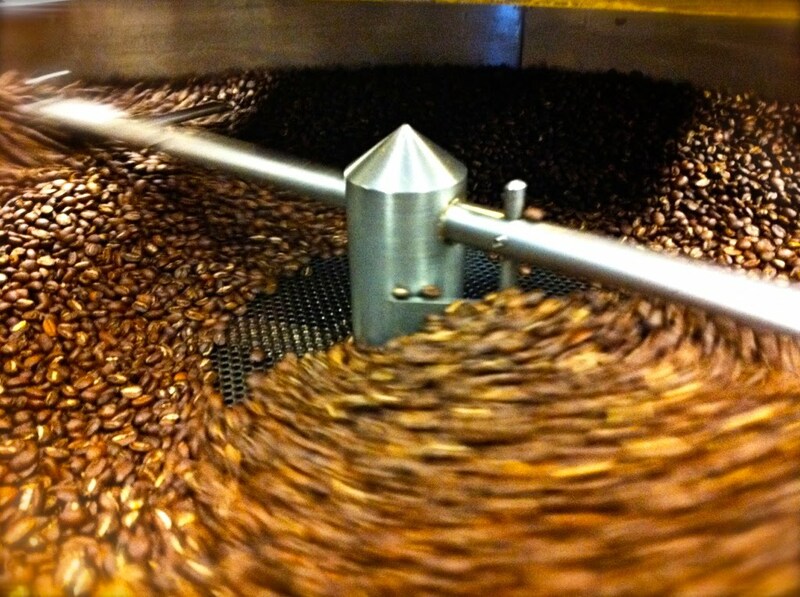 Roasted coffee beans rock, too!! That's awesome! Your twinner is great for doing this! Thanks! that's unreal. Sounds like it was a lovely wkd. you had Em.... Mine: 2 naps, fixing our dead car, playing games with friends, having little time with husband- but savoring that little time. cheers to a week ahead! I want some coffee with leg shimmys and fist pumps!!! Four months! How awesome! Congrats! And I will drink the coffee with tooth staining gusto! love the blog! and who doesn't love giveaways? congrats and thanks for your encouraging letters! Love your blog! My hubs would LOVE this!! Later! this would be a nice surprise for my husband:) love your letters. Yay! What a great giveaway. Fingers crossed to be the winner of yummy custom roasted beans! Three big fist pumps for free coffee!! woo hoo! i've only had one cup of coffee in my whole 30 years, but i would have a second and a third just for twinner...then i would have a big brunch with friends to share the rest. thanks twinner and mr. and mrs. loerke! Love the names of the blends! I'm sure they are delicious! oooh, i love coffee. thanks for the giveway. i am planning on increasing my coffee intake next week as i head back to work after taking a year off to be home with my wee one. i think i will need some serious caffeine to keep up with everything! With college starting around the corner, coffee would definitely be awesome! Thank you for your blog, no matter how crappy my day is going, I know I will get a smile or laugh when I sit down to read today's post! I have had her wonderful codfe befor and would be honored to again:) so fun!!! Yea for great sisters!!! A coffee giveaway is just brilliant! And I love the blend names. So great! I love the blog and would love to win. Seeing all these posts makes me so happy for todaysletters! What doesn't twinner do? Thankful for your letters. They make me want to be a better wife! Woo hoo! That's not so much about the coffee as the naps, popsicles, and movies. Sounds like a freakin' awesome weekend to me. I'd be jealous, but I had Gloria's for dinner on Thursday night and Macaroni Grill for dinner on Saturday night, so I wasn't exactly slacking in the "having a fun weekend" department. Congrats on the 4 months! This is one of my favorite blogs...inspirational, fun and great music. Oh! Did you say coffee! I can't decide which blend name I think is awesomer. That's a word, right? Save a popcicle for me! love the blend names. you know me, love my coffee. i love that you give things away. it's so fun! Huzzah for Todays Letters and 90 degree weather in California while being cooped up in the office! Last night da Hubs and I cooked together in our bigger cocina for the first time and whaddya know...a spontaneous leg kick and fist pump over took us...we were that excited. Shimmies, leg kicks and fist pumps oh my! Coffee is best while enjoyed in those comfy smartwools. What a great give-a-way! Thanks for Today's Letters and always bringing a smile to so many reader's faces. You share happiness on a daily basis--thank you! Love the names! Twinner rocks! If I get this coffee can you and Mr. Loerke come share it with me and my future hubz? To be honest I don't drink coffee but I'm sure my classmates would love some! I neeeeeeeeed this coffee. Please! Love the blog! oh my. leg shimmies and fist pumps galore. Oooooh! A giveaway! I will cherish this coffee if I win it FOREVER. Seriously. I am getting married in three weeks, what a lovely wedding gift this would make! woo hoo! My husband and I are in love with Today's Letters. Thank you for being an inspiration and teaching us how to live and learn in an intentional marriage! If we ever met in real life I believe we would become best friends. Is that a little creepy? The only thing better would be if they also came with SmartWools! Oh, I love those socks! Coffee is my reward for getting up in the morning. My husband and I celebrated 12 years of wedded bliss yesterday- and I am inspired by the work that you and Mr. do to make your marriage great. It's easy to see the things we don't like in our life partners- the harder part is to acknowledge those things that we love. Why is that? Thanks for sharing your lives with us- and making my marriage better! Pick me, please! Starting teaching this week and school starts at 7:15am. I need some coffee to keep me awake through the day! umm...pick me. pretty please with roasted beans on top. extra shimmies and fist pumps in my morning coffee!?! YES PLEASE!! I'm in. 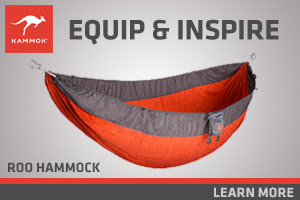 I heard the Woobie Cape Smartwool Blend keeps you well insulated while giving you super powers. oh my, i would love to taste both of these yummy little blends! Soooo, my wife already commented on here, but I think my comment is necessary to beat the odds! Happy 4 months! AWESOME giveaway! I love how personalized your monthly giveaways have been, such a fun idea. 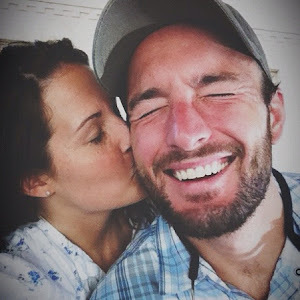 And of course I adore your blog. Climbing, camping, coffee with the Clydes... Special consideration for alliteration?? Thanks for appreciating each other & life so well. It's such a lovely example...and of course for 4 months of fist pumps etc. You two are so fun! you are the first blog that i follow who i do not know. sign me up for the coffee! thank you for your daily posts- they are inspiring and encouraging and your blog helps me to believe that all is possible :) thank you!!! Oooohhhhh.....I love coffee. And I love you blog. Then, to combine the two, would make me start would make me anything but blue! I alternately laugh and cry (in a good way!) when I read your blog. Drinking a great cup of coffee would make the whole top off the whole experience. I love winning. Winning is good. Winning two bags of my favorite beverage? The ultimate win. I'm in the UK i'm not sure if you can get coffee through customs but I figured I'd comment all the same. I'm currently squeezing my eyes shut and wishing to the coffee gods that they may shine grace down upon me so I can win those two bags of awesomeness. Consider this my "pick-me, pick-me"
I am fairly confident that I will win this giveaway...but!...if someone else should be graced with the awesomeness, where can I try it as a Berkeley local?? coffee coffee coffee!! woohoo!! oh, HOW will you choose the winner this week?? can't wait to taste the twinner's brew!!! Java java java!! Yay for giveaways!! I am with Sarah Spoonda though...can I taste the awesomeness in Berkeley, if I don't happen to win?? L<3VE the coffee... not as much as todays letters though!!!! love love love your letters -I laugh and sputter all over myself as I try to relay them to my husband who thinks I'm just being weird. He would much rather I just say "here, honey! I won you some great coffee!" me me me! =] love the blog! Thank you for sometimes making me laugh, sometimes making me tear up, and always inspiring hope in the possibility of a beautiful relationship (for me) some day! I love coffee and contests. And super special coffee made with love and purpose...doesn't get any better. I can already imagine myself sippin' outta my favorite handmade mug on the cliffs of the Pacific...this is the stuff dreams are made of. Wanna know why you should pick me? I work in a leasing office @ an apartment community and @ least once a month one of our residents gets fresh roasted coffee sent to her from her brother...she made me a cup when I shared homemade cupcakes with her...Otherwise the smell from the package closet is pure heaven and pure torture! hmmm....witty comment, witty comment....what to put as a witty comment?? 2. creative coffee names are glorious. free coffee? count me in! checking your blog has grown to be a part of my nightly routine. love the way you love. Pick me so I can give it to my really cute husband! Please! i love coffee and your blog! you two are such an inspiration to a little youngster lookin for love like myself! I have been looking at your blog for all of two...maybe three...days...depends on what day it was when I facebook messaged you at three a.m. :) But anyway, I already love your blog! We (the hubby-face and I) will be starting our Tuesday walks as more of a Thursday thing today...and we're calling them Thoughtful Thursdays. :) I'm so glad Amy said something about your blog on her facebook! COFFEE!!!! I live on a glacier in ALASKA! I drink instant coffee and that looks delicious..count me in! Please allow me to compare your twinner's blend to our Kona brew!!! I love coffee! I would love to be the winner of your twinner's coffee! Emily and Tim, I love reading your letters! I'm so glad you started this blog. Makes me want to savor the little things in life a whole lot more and to love everyone more and more. Good work friends! i would love some leg shimy to come my way. and i so appreciate coffee in its bestest roasted varieties. yay for sarah for being so generous! am i too late? i am always late. and tired. that is why i need this coffee!!! :)love to the loerkes! Oh, pick us, pick us! We really need it. Are we too late??? love the blog! would love the coffee! Maybe I missed it in the writing... Did you mention if there is a way to purchase Sarah's coffee? I'd love it if you could pass it on! Thanks! Dear coffee, you're my friend. Dear letter writers, you inspire me. Dear number-picking lottery device, pick me!